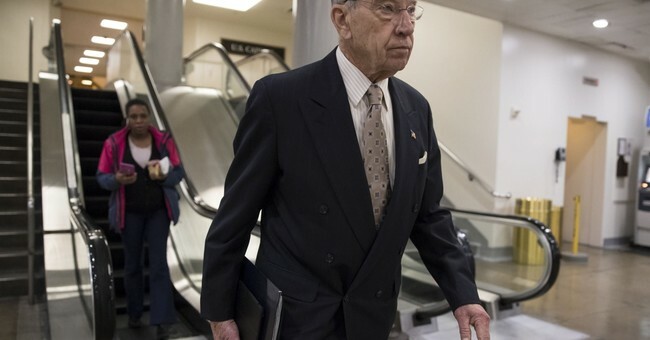 Senate Judiciary Committee Chairman Chuck Grassley (R-IA) has instructed any Supreme Court justice wishing to retire to make preparations in the next few weeks. Yesterday, if possible. The urgency, Grassley told radio host Hugh Hewitt, stems from the upcoming midterm elections. "I just hope that if there is going to be a nominee, I hope it’s now or within two or three weeks, because we’ve got to get this done before the election, and there’s generally about 50, 60, 70 days between the time a president nominates somebody and we get a hearing in committee, and then another two weeks before it gets to the floor," Grassley said. "And this has to be done before the November election. So my message to any one of the nine Supreme Court justices, if you’re thinking about quitting this year, do it yesterday." The chance that Democrats have to take back the Senate should strike a sense of urgency in any constitutional conservative, Grassley suggested. "If we have a Democrat Senate, you’re never going to get the kind of people that are strict constructionists that Don McGahn’s getting up to us. And you’re going to have people in not like, we’ll say, a little more like Kennedy, if you wanted to pick somebody out of the Supreme Court. That’s the kind of people we’re going to have on the Circuit Court." President Trump warmed conservatives' hearts by nominating Neil Gorsuch to replace the late Antonin Scalia on the bench. Gorsuch's confirmation remains one of Trump's biggest accomplishments. Since assuming office, Trump has also overseen a record number of federal judge appointments. Sixteen appeals court judges have been confirmed, as well as 17 district court judges. That doesn't mean Trump's judicial picks haven't faced resistance. Dozens of nominees are still waiting in the wings. For the past year, Democrats have withheld blue slips from the Judiciary committee. If both senators from a state withhold their blue slips for a certain nominee, they can block the nomination. This rebellion can slow down, but not entirely stop the judicial confirmation process. Grassley has indicated that there are "more exceptions to the blue-slip rule" at the circuit court level. The most recent case of obstructionism is in Wisconsin, where Democratic Sen. Tammy Baldwin is withholding her blue slip for federal judicial nominee Gordon Giampietro because of his past remarks on gay marriage.